The Fat Tire Fest is proud to announce that Specialized's Pro Ned Overend, MTB World Cup Champion, NORBA National Champion, National Cyclo-Cross Champion and National XTerra Champion will be joining us with new special guest pro Sid Taberlay of Specialized's Team Sho-Air! 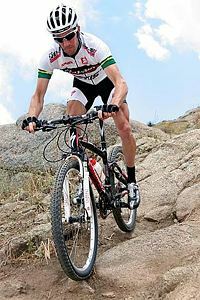 Five-time Australian National Champion and Athens Olympian Sid Taberlay is one of the fastest XC riders in North America. Now you can meet and ride with three champions - World Cup Champion Ned Overend, World Champion Brian Lopes and Olympian Sid Taberlay on the advanced ride and skills clinic!! Check the Fat Tire Fest Events Schedule and bring your rigs for a full day of mountain biking action! CORBA also is pleased to announce our new exhibitors Pasadena Cyclery, Complete PT, the Mountain Bike Unit, Los Angeles County Bicycle Coalition, and the North Ranch Mountain Bikers. Thank you for supporting CORBA and participating! We wish to thank our new donors Slime and Clif Bar for their generous contributions of Slime tubes and Clif bars, and U.S. Cup and H2O Overdrive! Thanks to all our great exhibitors and generous donors who are contributing to the Fat Tire Fest! Check them out on the Fat Tire Fest web site on the exhibitors and prizes page. See what fantastic prizes you can win in the Fest raffle! When you are at the Fat Tire Fest you can now recycle plastic and cans with recycling bins generously donated by Waste Management Inc! Please help this event be as green as possible by using these for recycling. The current Accuweather forecast for Castaic Lake on Oct 25th is for sunny and 89 degrees. For all CORBA Fat Tire Fest 2009 events, schedule, directions, registration and prizes and all Fest details go to: www.corbamtb.com or www.fattirefest.com! Come on out and ride for the trails!! Support CORBA and mountain bike trail access in Los Angeles and the surrounding area!